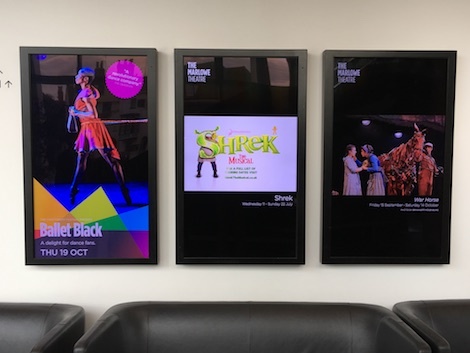 The Marlowe Theatre in Canterbury recently replaced 17 older media players with Signagelive and Chromebox and added in an additional 13 x 22” Samsung screens also using Signagelive. 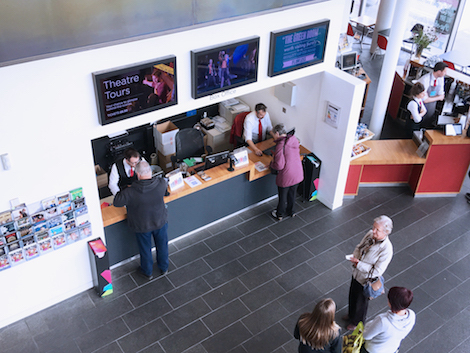 The 22” screens are located above the door leading to the auditorium and are used to relay important information to customers about the show. Information such as how long the show is, warnings such as strobe lighting, loud bangs or no photography. The digital signage upgrade was originally about promoting the Theatre Productions and the Restaurant they have on site, but it was soon obvious to their senior management team that this new system, which was easy to use, was also about how they communicated with their customers. Paul continued “Over 400,000 people enter the building a year, and the style in which we speak to our customers is important. Therefore, we implemented a further 13 mini 22 inch screens at our door entry points to relay important information about the performances to our customers. This, in our opinion is the standard that our customers expect from a Theatre of our standing when they have paid up to £65 for a ticket. These mini screens, plus our 17 full size screens are now integral part of our communication and marketing campaign to all our patrons, whenever our doors are open, which is 7 days a weeks from 9am to 10-30pm. Gone are the days of unsightly posters and notices, we love our style and the ability to change any screens at the touch of a button”. Marlowe Theatre is on the UK Number One touring circuit, seats 1200 people, presenting productions such as the National Theatre’s War Horse, Mamma Mia, Glyndebourne, Philharmonia Orchestra and The RSC. This entry was posted on Monday, October 16th, 2017 at 13:32 @605 and is filed under DailyDOOH Update. You can follow any responses to this entry through the RSS 2.0 feed. You can leave a response, or trackback from your own site.